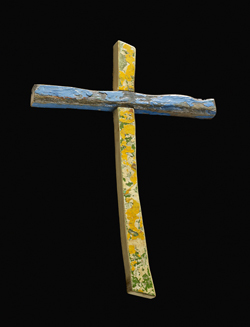 Donated to the British Museum in October (the last acquisition made under former director Neil MacGregor), the Lampedusa Cross was constructed by carpenter Francesco Tuccio out of wreckage from a refugee boat which sank off the Italian island of Lampedusa on 3rd October, 2013. At least 349 of the 500 refugees on board were drowned, some of whom were Eritrean Christians fleeing persecution, while 151 survived. Mr Tuccio, a resident of Lampedusa, decided to make a series of small crosses from the wreckage after meeting some of the refugees in the church of San Gerlando as a gift for them to both reflect their salvation and as a symbol of hope for the future. He was subsequently also asked to make a further cross which was carried by Pope Francis at the memorial service for the survivors. Asked by the British Museum if it could acquire a cross for its collection, Mr Tuccio made a cross specifically for the museum which he then donated to the institution, saying after he received a letter of thanks that “it is I who should thank you for drawing attention to the burden symbolised by this small piece of wood.” The cross went on display in Room 2 of the museum on 18th December (the last day of Mr MacGregor’s directorship). Entry is free. For more on the British Museum, see www.britishmuseum.org. PICTURE: © Trustees of the British Museum.